- Participating in “in-cosmetics Global 2019,” a cosmetics formula exhibition held in Paris, France - Presented product features specified for various client groups, such as beauty care product formulas and all-natural materials for sensitive skin. - Established Tech Center to provide total solutions for client companies by combining marketing and R&D. A Samyang Group (CEO: Kim Yoon) subsidiary, KCI, which is exclusively in charge of beauty and personal care, will accelerate global market penetration. On the 29th, KCI (CEO: Jin-Yong Lee) announced that it will participate in “in-Cosmetics Global 2019” exhibition, which will take place in Paris, France from April 2nd to the 4th. In-Cosmetics Global is the world’s biggest exhibition related to cosmetic formulas, held annually in Europe. In last year’s exhibition, 773 companies from 43 countries attended. At this exhibition, KCI will be presenting various formulas to meet the needs of the market, in addition to the formulas of personal care products such as moisturizers, thickeners, and film formers. KCI emphasizes formula characteristics such as sensitive-skin-friendly, intense moisturization, and all-natural. Additionally, KCI will use these formulas to present various products to increase the existing customers’ brand loyalty and secure potential new customers. In particular, KCI will be emphasizing the Tech Center’s strategy of a “customer centered solution” at this exhibition. KCI's Tech Center, which was established last year, is an organization that combines marketing and R&D. The organization aims to provide client companies with a total solution for new product ideas, quality & function improvement, and final product development, to accelerate production and produce mutual profits for both sides. KCI CEO Jin-Yong Lee stated that "KCI's global sales are more than five times that of domestic sales," explaining that, “in order to solidify our position in the global market, we are in the process of strategizing a marketing solution that also considers the development of our customers’ products." KCI was acquired by Samyang Group in December 2017. In accordance with Samyang Group’s growth trajectory, the “expansion of the global market, development of specialty products, and new businesses,” the company is accelerating global market penetration and the development of joint technologies with food, chemical, and pharmaceutical-bio businesses. - Propose new business ideas through “Growth Talk” programs and form teams to materialize these ideas - Present ideas to executives….Receive advice from internal employees, mentoring, and expanding your network - “To make communication and taking on creative challenges a part of Samyang Group’s company culture through the Growth Talk program” Samyang Group (CEO: Kim Yoon) is aiming to catch two birds with one stone by revitalizing corporate culture and discovering new business, through convergence of the group’s internal technologies and by facilitating active communication. Samyang Holdings announced on the 29th that they had organized the “1st Growth Talk Idea Pitching Day” on the 28th in Seongnam Pangyo’s Samyang Discovery Center, to discover and foster new business ideas within the company. Samyang Holdings has been running the Growth Talk program since last year in order to spread the culture of communication and to take up challenges within the group, and to support discoveries of new business ideas. Growth Talk is a program that helps ideas come to life by teaming up employees that propose or share ideas about new businesses. On this Idea Pitching Day, the team that proposed an idea in the last quarter made a presentation to the executives, sought advice and mentorship, and expanded their networks. The ideas proposed in the Growth Talk will be formally examined through processes such as prototype productions and determined if they are fit to be part of a new business. Out of the new business ideas presented, ideas such as combining the potential of a medical biology business with food business and expanding a food business’ premix products to a pet market drew the attention of many participants. The President of Samyang Holdings, Yun Jae Yeob, stated: “I hope to make communication and taking on creative challenges a part of Samyang Group’s corporate culture through the Growth Talk program. Our company will provide all the necessary support for the Growth Talk program to be a success.” On the other hand, Samyang Group is focusing on developing their business through a combination strategy in which they combine open innovation through communication with outside resources with Samyang Group’s internal business potential and produce new technology and products. Currently, Samyang Group is engaged in four business areas: food, chemical, packaging, and pharmaceutical biotechnology. - Scholarships amounting to KRW 965 million given to 206 high school, university and graduate school students upon the recommendation of schools - Continuous activity from 1939 with support for tuition and research costs to over 20,000 students and 600 professors Samyang Group’s Yangyoung Foundation/Sudang Foundation (Chairman of the Board: Kim Sang-ha, Samyang Group Chairman) held the ‘2019 Yangyoung Foundation/Sudang Foundation Scholarship Ceremony’ at the Samyang Group headquarters auditorium on February 20. On this day, the Yangyoung Foundation awarded scholarships to ninety-three university and graduate students while the Sudang Foundation awarded scholarships to twenty-two university students and ninety-one high school students. 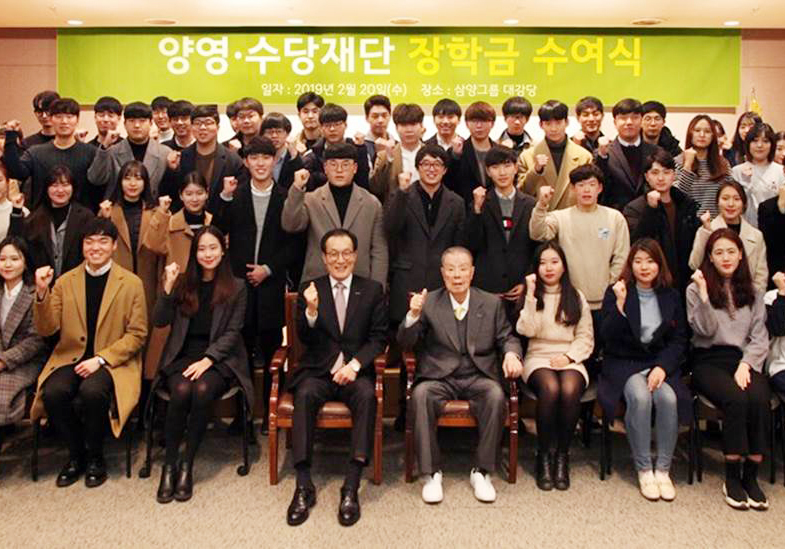 A total of KRW 965 million in scholarships was awarded to 206 students. The students who received scholarships were selected by recommendation from each school as model students who maintained excellent grades despite their difficult environments. Under the socially contributive philosophy “Providing the opportunity to dream,” Samyang Group unceasingly carries out scholarship projects, research cost and academic support through the two scholarship foundations “Yangyoung Foundation” and “Sudang Foundation.” To this day, the two foundations have aided over 20,000 students and 600 professors with scholarships and research costs. Samyang Group’s Yangyoung Foundation, a pioneer of civil scholarship foundations, was established by the late Sudang, Kim Yeonsu, the founder of Samyang Corporation, in 1939. Sudang Foundation was established by Chairman Kim and his children in 1968 as part of an extension of the scholarship undertakings, and in addition to the scholarship business, the foundation currently administers the Sudang Award, which awards a total of KRW 300 million to professors who have produced achievements in the fields of basic science, applied science, and humanities/social sciences. 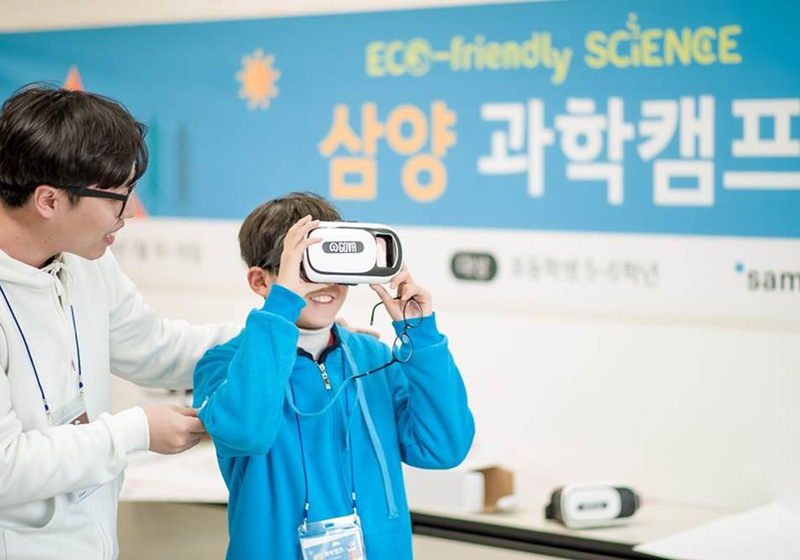 - Held at the Daejeon Samyang Group R&D Center, the Samyang Science Camp hosts 100 students in the 5th and 6th grades over the course of two days and one night. - Samyang Corporation and Samyang Packaging Company began hosting this annually-held camp starting last year in order to foster young peoples’ interest in science. - This camp’s main mission is to reinforce the importance of resource recirculation and environmental protection through activities involving recycled materials. Samyang Group (Chairman Yoon Kim) cultivates and encourages the dreams of future scientists. 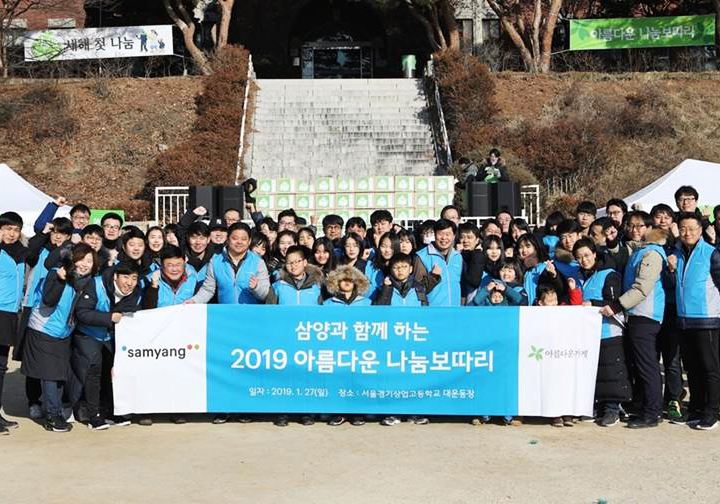 Together, with Korea Food for the Hungry International, Samyang Group invites 100 students in the 5th and 6th grades from nearby elementary schools to attend the ‘Samyang Science Camp’ starting the 18th and lasting two days, one night. The Samyang Science Camp, hosted annually by Samyang Corporation and Samyang Packaging starting last year, gives elementary school students the opportunity to make their science dreams come true by allowing them to conduct various experiments and experience what it is like to be a true scientist. The elementary school students who attend this camp can take part in programs such as △future car making, △virtual reality experience, △Bluetooth speaker making, and △trash-sorting Goldberg machine-making. These activities will allow students to discover and experience scientific principles in real life. The future car making program begins by educating students about the various forms of future cars and engineering plastics (lightweight automobile materials), and is then followed by a model car-making activity. During the virtual reality experience, students can learn about virtual reality, which is defined as a key technology of the Fourth Industrial Revolution. While experiencing environment-oriented VR content, students will also learn about possible future occupations within the field. Students will have the opportunity to make Bluetooth speakers and Goldberg machines with recycled materials while learning the importance of environmental protection and resource recycling. The Goldberg machine - a machine that performs simple jobs through a complicated chain of reactions - helps develop creativity in students in both the designing and the assembly processes. - Chairman Kim Yoon grasps the direction of IT and seeks new business with the CTO, director of research, and subsidiary representatives - Samyang Group to select the model of ‘digital innovation’ through a new management policy, strengthen digital capacity, and discover technological convergence - Management to equip itself with a digital mindset starting with its executives to promote Samyang Group’s digital innovation Chairman Kim Yoon of Samyang Group attended the Consumer Electronics Show 2019 (CES) in Las Vegas, U.S.A. with the management on Jan. 10 (local time). CES is the world’s largest IT and home appliances exhibition held annually in Las Vegas, U.S.A. Chairman Kim Yoon visited CES with main management to determine the newest IT direction and explore new business opportunities. This was the first time that the management of Samyang Group attended CES as a group. Chairman Kim Yoon surveyed technology related to the Fourth Industrial Revolution like 3D printing, AI, and drones centered around vehicles and electronic devices. He sought effective connections with the chemical, food, packaging, and biopharmaceutical businesses managed by Samyang Group and shared new business insight regarding the use of digital technology with management. Many major clients attended this exhibition, as the main business of Samyang Corporation AM BU is engineering plastics centered around polycarbonates. At present, Samyang Corporation supplies domestic and overseas companies with engineering plastics for automobile parts and finished car manufacturing businesses as well as electric and electronic businesses. Samyang Corporation also currently supplies information and electronics materials to global display manufacturers. Chairman Kim Yoon stated, “We must use digital technology and focus on digital innovation with the aim to redefine the quality of the business,” and requested that “the Management and staff be equipped with a digital mindset to improve technology intelligibility.” For its management policy this year, Samyang Group proposed a digital innovation along with responsible management and pursuit of growth so as to accelerate strengthened digital capacities of the group in its entirety. A large number of business representatives, CTOs, and research directors attended this exhibition with the aim to discover technological convergence that transcends businesses and to fortify the digital capacities of management. Samyang Group (CEO: Kim Yoon) revealed on the 27th that a donation of 300 million won had been made to the Community Chest of Korea upon 2018 drawing to a close. The donation will be funneled into support programs for basic living and essential medical expenditures for the underprivileged. Samyang Group has continually provided annual contributions through the Community Chest of Korea over the years since 2001. A Samyang Group official remarked, “We hope that the heart-filled donations of our staff here Samyang Group will enable our less fortunate neighbors enjoy a warm winter season.” Samyang Group has committed itself entirely to various donation activities, in addition to fostering talented individuals through the Yangyoung Foundation and Sudang Foundation. Recently, the group is progressively advocating social contribution activities related to environmental conservation and health in the areas of chemistry, food, packaging, biopharmaceuticals, and more, in accordance with the group’s vision to make ”Ingredients that Add Value to Life,” in step with the succession and growth of scholarship projects, as well. Samyang Group hosted the Samyang Innovation R&D Fair 2018 (SIRF 2018) at Samyang Discovery Center in Pangyo on November 6th. SIRF is an event at which researchers of Samyang Group exhibit and share the outcomes of research and development they have worked on for the past year. At this year’s SIRF, approximately 90 cases of research performance from research centers of chemical, food, biopharmaceutical and IT materials, as well as those from Samyang Packaging and KCI were exhibited. Notably, Samyang Packaging and KCI participated in SIRF for the first time this year. Along with an exhibition of their R&D achievements, Samyang Group hosted an award ceremony to recognize and reward a total of eight outstanding achievements, including three R&D success cases, three patent cases, and two CoP cases. The value of the rewards given out this year was double the value of last year’s, which reflects the Group’s increased interest and expectations for their R&D sector. In Chairman Kim Yoon’s congratulatory remarks, he mentioned three R&D key terms which were: ▲acceleration of open innovation, ▲expansion of the Group’s expertise areas through amalgamation, and ▲smart data-based R&D. Open innovation is a strategy to add external capabilities upon Samyang’s existing abilities to accelerate the speed of change and innovation. Amalgamation refers to the collaboration of the different skills developed within various departments within Samyang Group to develop new products and skills. Chairman Kim Yoon emphasized the need for open innovation and amalgamation, not only within the R&D sector of the Group but within the entire Group itself, encouraging more intra-sector communication and cooperation.